It’s that time of year again! The sun is coming out and filling our windows with warm sunlight. When it comes to growing your own herbs, it is much easier than you think – even for city dwellers! Growing your own herbs is great because it does not require much space, and can go a long way with food. In this post we will provide you everything you need to know about starting your own indoor herb garden. Various terra cotta pots or containers that are garden friendly, meaning they won’t rust or trap excess water in the bottom. This means that you’ll need to make sure the containers you use have small slits or holes in the bottom for proper drainage. Proper drainage is very important when it comes to successfully growing plants. We suggest terra cotta pots with saucers to catch the drainage over any other container. Here are some general guidelines for choosing a container. First set up your pots and put enough river stones in each pot to just cover the bottom. Then put enough soil to fill the pot about half-way. Now you’re ready to put your herbs in the pots! If your sprouting your herbs from seeds, you’ll need to germinate them in water. The process for sprouting them isn’t impossible. However, it is time consuming and often difficult when you have such a small space, and best left to professionals. If you insist on growing them from a seed – refer to this guide. We suggest going to a local farmers market or nursery for seedlings. Buy established toddler herbs and you’ll get edible results much sooner…and they’ll be a lot less likely to die in infancy. If you’re a beginner, start with basil! Basil is a very hearty herb. It is helpful for gardeners without a lot of experience because it will let you know immediately if it is not getting enough water by looking very sad and wilted. Small tomatoes are also fairly easy to grow, as well as chives and scallions. With chives and scallions, you can simply buy them at the grocery store and as long as they have healthy looking roots, you can stick them in soil and keep growing them that way. 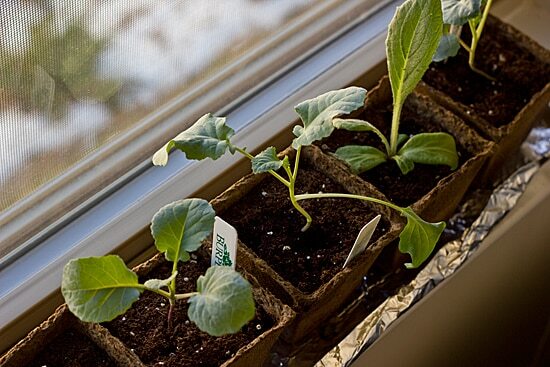 After un-potting your seedlings, place them gently on top of your soil, and fill the pot up with more soil. Tuck the plants down with the extra soil and be sure they are snugly in each container, but not too tight. Be sure it is loose enough for roots to grow. You can use a fork to pack down the soil. Now all you need to do is water your plants on a regular basis. It is easy to over-water them. Be sure to check the soil before watering the plants. If the soil feels moist, let it be. If it is completely dry, then you should definitely water it. There’s definitely something magical about watching a plant that you’ve been nurturing grow bigger and bigger everyday. Don’t forget to trim your herbs and enjoy them in your cooking adventures! We hope that you have enjoyed this post by Protect America, a leader in wireless home security technology.